Welcoming a newborn into the world is truly a time for joy and celebration- because each new life is a miracle and in every single baby, a star is born. For more than four generations, the Conway Medical Center family has had the privilege of helping tens of thousands of parents throughout Horry County welcome their babies into the world. Because this is an honor for which we are deeply grateful, Conway Medical Center Foundation has developed this unique program to commemorate the birth of your loved one. Through our recognition program, A Star is Born, parents, grandparents, family and friends have the opportunity to celebrate the gift of a new life with a gift that can truly make a difference in the lives of others. 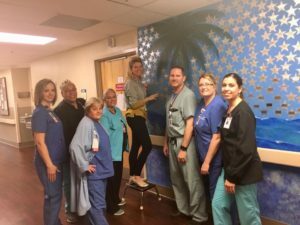 The CMC Foundation, along with the CMC Auxiliary, has commissioned a painted mural in recognition of the babies born at Conway Medical Center over the years. The beautiful painting, depicting our scenic coastline allows for more stars to be added commemorating births. 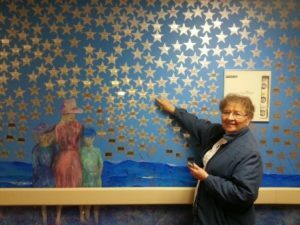 For a donation of $50 or more, parents, relatives or loved ones may celebrate a child’s birth by adding a star to the mural in his or her honor. The star, which will be permanently affixed to the mural, will be engraved with the baby’s name and birth dates. 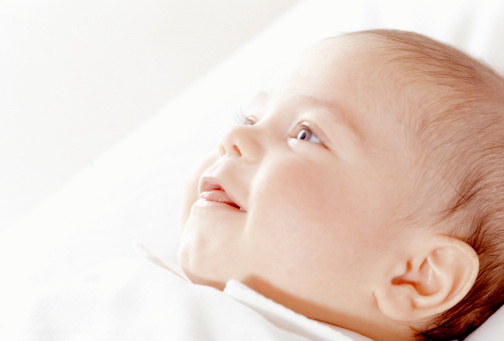 Best of all, the opportunity extends to everyone ever born at Conway Medical Center. Adults as well as newborns, may join the family of stars born at CMC by having a special star created in honor of their births. This opportunity is not only a perfect way to commemorate a new birth, it also is a nice gesture to honor a loved one’s birthday or special occasion. All contributions to this program will directly enhance the levels of health care provided in the Nursery, Labor and Delivery and Pediatrics nursing units at CMC. Susan Scarce – Development Officer, placing her sons star on the wall along side of CMC Maternal & LD staff. To create a star to commemorate the birth of a special person click here or download this form. Joan Bonello, a proud Great Grandmother, placing her great grandaughter’s star.